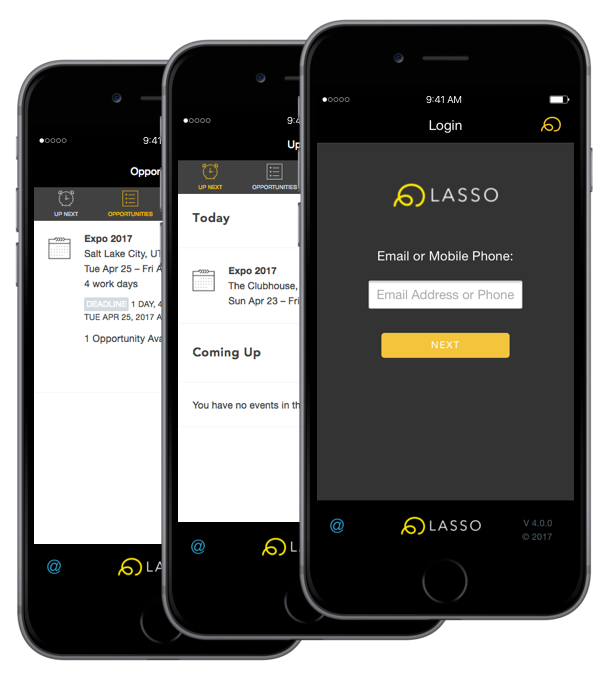 Connect with your crew when and where it matters most with the new and improved LASSO Mobile App. Send your crew new job opportunities as well as schedule, confirm and communicate with them throughout your gig with ease. Your workforce is able to access new opportunities, submit their availability for jobs and view their upcoming schedule as well as get the latest and greatest job details and instructions through the mobile app. The LASSO platform is revolutionizing contingent workforce management by helping streamline vital labor processes such as on-boarding, scheduling, communication, time tracking and more. Are you a customer or a crew member and need technical support? Contact LASSO Support here or email support@lasso.io. LASSO Mobile for iOS works on all Apple phones running iOS version 9.0 and above. LASSO Mobile for Android should work on all phones running Android version 4.2.x (“Jelly Bean”) and above. Please visit the App store on your device to confirm compatibility.